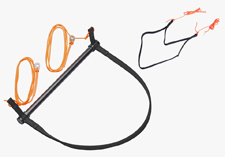 The complete speed system consists of a carbon speedbar with webbing loop, lines and Brummel hooks. ADVANCE also offers a LIGHT speedsystem. Its simple concept is easy on the eye and provides everything you need to keep on reliably stepping on the gas. With its two rungs and angled attachment the light and robust carbon speedbar is always easy to reach in flight.